I paused outside the audience chamber to lean against the wall. I desperately needed to get my emotions under control. I couldn't afford to loose control, not now. Later when I could afford the luxury of being in private, I would let it all out. Until then, I would have to hope that damn mask would be able to hold my emotions in check. The first thing on my agenda had been to find Sheila, but it occurred to me that I was running around in armor that had been trashed. I walked down to my room and began to strip the slagged chain mail over my head when I realized that I didn't have Thomas around to help me avoid ripping my hair out. I managed to get the armor off without doing too much damage, but it was a painful reminder of my loss in more ways than one. The next to go was the leather coat and undershirt. Both of them had been scorched and burned by the magical attacks that Yoseph had unleashed on me. I paused to look at myself in the mirror and almost cried at the sight. The damage from the spells hadn't been limited to just my armor. My fur was burned and scorched in a spider web pattern around the amulet with the majority of the damage in the center where the medallion rested. 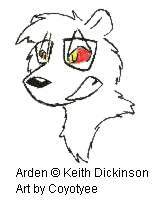 Although the burns I had received were almost healed already, apparently the dragons regenerative powers wouldn't do anything for my fur. It was heartbreaking to look at. I forced myself away from the image in the mirror and over to the armoire to look for alternative attire. Since I had no functional armor other than the skirts, I decided to discard what I was wearing and just go with one of the dresses I had commissioned back with the sisters. I chose the one with the split sides that would fully cover my damaged chest fur while still giving me plenty of mobility for my legs. Again, I was reminded of Thomas' loss as I struggled with the ties in the back. It's not that they were particularly difficult, I had simply become used his assistance. Another burst of emotions shattered what control I had managed to maintain. I sat wearily on the edge of the bed as the feelings of loss and grief poured from me. He had been my best friend in this world as well as my squire. I had almost come to think of him as my son and now all of that was gone. After a short time, there came a knock at the door. I tried to ignore whoever it was, but they were persistent. "Go away!" I ordered, but to no avail. Finally fed up with the knocking, I slapped the bolt back and opened the door to see Yoseph standing on the other side. "Are you all right, Arden?" he asked quietly. Was he kidding? I was a mess. "Yes, I am. Thank you for asking," I replied curtly. "Now if you will excuse me, I must deal with something." I didn't give him time to answer before I closed and bolted the door. I turned and walked back to the bed. On the nightstand was the book that Thomas had been studying. I looked around and noticed lots of little things that were his. Clothes, books, his training sword and armor. At first I thought I'd have to pack it all up, but then it occurred to me that there wasn't anyone he would have wanted it given to. That made things all the worse, as Sheila and I had become the only family he knew. He had been so happy to get away from his stepmother and her relatives, and now all his dreams and hopes were gone. I heard a small popping sound behind me and let out a low growl. "If you don't get out of here by the time I count to ten, I'm going to kill you," I said quietly. "Please, Arden," Yoseph said as he sat on the bed behind me. "You don't have to carry this burden alone. Let me help." "Help?" I asked incredulously. "Haven't you helped enough?" I turned to face him. "You've killed my squire. He was my best friend in this godforsaken world, and you killed him." I stood and moved away from him, trying to distance myself. I don't know who I was more angry with, him or myself. Yoseph hung his head and gave it a sorrowful shake. "Don't you think I know that?" he asked solemnly. He looked up at me with anguished eyes. "Do you think I'm proud of what I did? Do you think I like the thought of having killed a child?" He stood and walked over to me. "His death is my responsibility, Arden. Please, don't blame yourself." I crossed my arms, hugging myself unconsciously. "And what makes you think I'm blaming myself?" I asked as I again tried to distance myself from him. I didn't like the way he was getting inside my head. He turned and followed, keeping close but never invading my personal space. "Because I know what its like to loose a squire in battle," he said earnestly. "I know that he must have been your first squire. You're too young to have been forced to go through this before." I shook my head in denial. "But ultimately it was my fault," I replied. "I knew there was going to be trouble as soon as we stepped in the room. I should have sent him back outside." He nodded and leaned against the wall as he talked. "But you didn't, I know. You did order him to stay back when I drew on you. From the start you maneuvered yourself to make sure that he was never in any danger of being injured." I sat back down on the edge of the bed and looked at the floor. "None the less, he died," I said flatly. "He threw his life away in a meaningless attack that accomplished nothing." "NO!" Yoseph said vehemently. "Don't you dare cheapen his death like that!" He grabbed me by my arms and lifted me from the bed. "He died like a warrior, trying to save your life, and succeeded. Don't you dare try to dismiss his sacrifice!" His reaction startled me. The look in his eye was as intense as the passion in his voice. He obviously had some emotional scar that this touched. Yoseph released me, took a step back and turned to look out the window. "I've known squires that talked a good fight, but when the time came to show their merit they turned and ran," he said with a little more control, though he was still angry. "Your squire attacked an adversary he knew he could never defeat as a distraction, knowing full well he'd probably die. That kind of valor is rare in one so young." He paused for a second before he repeated in a low voice, "Don't ever cheapen what he did." I sighed, shook my head and asked in a sorrowful voice, "So that's supposed to make it all right? His sacrifice was a 'noble' one and that's supposed to make some kind of difference to me?" I sat back down on the bed and leaned against the post. I was weary with physical and emotional exhaustion. Yoseph sat down beside me and put a hand on my shoulder. "His death had meaning," he said gently. "He died doing what he wanted to do, supporting you. He could have died in a rockslide, or a fall from a horse, or even choking on a bone. That would have been meaningless." He gave my shoulder a small squeeze before he continued, "You can either look at what he did and acknowledge that what happened was his choice, or you can continue to blame yourself for what he chose to do. If you decide to wallow in self pity, then you will prove you weren't worth the sacrifice." The voice startled me. "Illiam?" I said as I glanced around. "Illiam?" Yoseph asked in a confused voice as he also looked around, trying to spot what I was looking for. "Arden, can you join me in the astral please?" "Why? What's going on, Illiam?" I asked to the air. Yoseph looked around some more and asked, "Who are you talking to?" "We've got a problem, Arden. Can you come here, please?" I waved a hand at Yoseph to try to quiet him. "Is it urgent, Illiam?" I really didn't feel like having to deal with anything having to do with the dragon right now. Yoseph opened his mouth to speak, but saw the look I gave him and snapped his mouth shut. "It is a matter that only you can deal with, Arden." I let out a sigh of exasperation and looked over to Yoseph. "I must go for a moment. I've been summoned to deal with a problem. I'll be back as soon as I can," I said as I stood. Yoseph started to say something, but I didn't hang around to hear it. It took almost no effort to step into the astral where I saw Illiam looking rather sheepish. Illiam gestured behind me. When I turned and looked, I saw Thomas' spirit standing there. "He won't cross over, Arden," Illium said in a somewhat annoyed voice. Looking at Thomas made my heart soar and sink at the same time. He had this puppy dog look on his face that says he knew he had screwed up and expected to catch hell for it. I stepped over to him and knelt down. "Thomas, why are you still here?" I asked gently. He shrugged. "I can't go, Miss Arden. You still need me," he replied. My heart went out to him. It was hard to refuse him but I smiled and shook my head. "No, Thomas. You're duty to me is done. It's time for you to move on now. You're life here is over," I explained while trying to keep the smile on my face. He shook his head. "No," he replied determinedly. "My job isn't done. I just know there's something else I could be doing for you. I know it." I let out a small sigh as I brushed my paw through his hair. "You saved my life today, Thomas. There's nothing more for you to do for me now. Please, you must go," I said earnestly. "No! There's more, I know it!" he stated forcefully. His hand was clenched in a fist to emphasize the words. "I know there's something else I can do for you, I just don't know what. I know it!" I stood up and looked down on him with a stern expression. "You're right. I have one last order for you," I said, watching his expression. I paused for a second to make sure my voice wouldn't crack then said, "I order you cross over, Thomas. Your duty to me lies beyond this life." He shook his head and answered, "No. I won't go." It was time to change tactics. "Do you see, Illiam?" I asked the dragon. "You see the crap I put up with?" I said as I looked back at Thomas. "I take this kid, make him a squire, try to teach him what it means to be a warrior and what do I get? Attitude and disobedience." I crossed my arms and glowered darkly at Thomas. "Sheila was right. He was more trouble than he was worth. I never should have taken him on." "No!" Thomas cried out. "You don't mean that." "See? Even now he argues with me," I quipped offhandedly. I stepped over towards him, grabbed him by his tunic, and lifted him up to face level. "I spent a lot of time and effort on you and in the end, you got yourself killed for nothing!" I gave a sneer of disdain as I tossed him to the ground. It took every ounce of my control to maintain the harsh look on my face. "No! I distracted him. I saved your life!" he said in rebuttal. I let out a bark of laughter. "You idiot! Do really think he had me defeated?" I asked sarcastically. "I was setting him up." The look of shock and horror on Thomas' face was almost enough to break through the mask, but I forced myself to maintain control. I had to drive him away so that he would be free of this world. "No!" he cried out, tears streaming down his face. "That's a lie!" "Look at me," I ordered. "I can step in and out of the astral realm at will. I can travel to the spirit realms. I was toying with the Elite so I could catch him off guard. You accomplished nothing other than to get your self killed." I deserve an Oscar for the look of disgust that was on my face. You couldn't find better acting if you had Tom Hanks playing the part. Thomas knelt of the floor, appalled by what I was saying. If it were true, then he had died for nothing. He had disobeyed me and gotten himself killed all for nothing. I could see what was running through his mind by his aura. "You really are a disappointment to me," I said finally. "Go ahead and haunt this place if you want, but don't expect any sympathy from me. I don't coddle losers." With that last I turned and walked back over to Illiam as I listened to Thomas. Thomas stood and began walking away. I could hear the gate forming that would take him to the next life. I could only hope he would forgive me for what I had done. For several long seconds I waited for the sound of the gate closing, but heard Illiam moan instead. I turned and saw Thomas walking back over to me with a determined look on his face. Thomas stopped a couple of feet from me and gave me a hard look. "I know what you're trying to do, and it won't work, Miss Arden," he said determinedly. "I won't let you drive me away. I still have some service I can do for you, I know it." I sighed and let my shoulders slump in defeat. What the hell was I supposed to do with this kid now? I glanced over at Illiam, but he just shrugged. It was going to be my problem. I thought about bringing him over into the real world, but I could imagine how well a ghost would go over as a squire, though the image of him haunting the Countess did tempt me. In the end, there was only one place I could think of where he might be useful. "All right, boy," I said in surrender. "If you won't move on, then maybe there is something you can do for me." I walked over, put my paw on his shoulder, and took us to Nanuk's realm. "Where are we?" Thomas asked as he looked around. I lead him towards Nanuk's hut. "This is the realm of my Totem, Nanuk," I explained. "Nanuk is one of the animal spirits. She is also, in a way, my mother." As we reached the door, I unlatched it and led Thomas in, closing the door behind us. The room hadn't changed since earlier this afternoon. I could still see the odd tinge of anger that my magic had infused the room with, regretting what I had inadvertently done. I looked down at Thomas and saw him examining the room nervously. I placed my paw on his shoulder again and guided him over to the cot where Nanuk lay. She watched us with an intense gaze as we approached. "She's a bear," Thomas observed as we stopped by her cot. "As was I, Thomas," I commented as I knelt beside the cot. "Mother, this is my squire, Thomas. Thomas, this is Nanuk." I watched as Thomas held his hand out to Nanuk without any apparent fear or hesitation. Nanuk gave me a curious glance before she lifted a weak paw to shake Thomas' hand. "It is good to meet you, Thomas," she said politely before looking over at me, "though I am curious as to exactly why you are here." Her statement was clearly meant as a question for me. "Thomas was killed today while saving my life, Mother," I explained carefully, trying to insure I didn't put anything in the wrong context. "That would explain why he's dead," Nanuk said sarcastically. "But it doesn't explain why you brought him here. He's not one of ours, child. He doesn't belong here." I glanced over at Thomas and saw a nervous look on his face. This was all unknown territory for him. "Thomas refused to move on, Mother," I replied. "He insists on continuing to serve me, even in death. Although I've tried to convince him that's not possible, he still refuses to leave." Nanuk let out a long sigh. "When are you going to tell me why he's here?" she asked, sounding somewhat annoyed. I let out a small sigh of my own. "You need someone to help you here, Mother," I explained. "I thought maybe I would be able to give Thomas some of my power to help maintain this place, and take that burden from you." Nanuk shook her head slightly. "He's not bear, child. His spirit is fox. What you ask for is unheard of," she said quietly. "As unheard of as the dragon granting a bear total access to its power?" I asked in return. Nanuk's eyes shot wide open as her ears perked up. "Total access?" she asked. I gave a very predatory grin. "Total," I replied. "I have the same access as all the guardian dragons have now, Mother. I can tap his reserve at will." Nanuk got a pained look on her face. "Oh, child, please tell me that isn't so," she said sorrowfully. "Now he can control you at his will." I could see she was disappointed in me, but obviously she was unaware of what had happened between me and the dragon, despite the fact it had occurred here. "He's already tried that, Mother," I said with a small grin of satisfaction. "It didn't work. I'm not a creature such as the guardian dragons, or a spirit like yourself. I'm a mortal born of free will, and he can't control me." I saw Nanuk nod as she relaxed a little at my revelation. "Be careful, my child," she warned as she fought for breath. "Lakash is no fool. He will find a way to use this against you in the end." I nodded as I stroked the fur on her head. "I will, Mother. So how about Thomas?" I asked as I drew the boy forward. "Are you willing to give him a try as caretaker of the realm?" Nanuk looked Thomas over. I could tell she was using her power, though I had no clue what she was doing. Finally she relaxed and reached out to take his hand. "You wish to do this thing, boy?" she asked. Thomas looked over at me and back at Nanuk. "If Miss Arden says that she needs me to take care of you, then I guess that's what I'll have to do," he said with a nod. "You don't sound very sure of yourself," she asked as she narrowed her eyes at the boy. Thomas gave a little shrug. "I know that my time with Miss Arden isn't done," he said with great assurance. "I don't know how, or why I know it, I just do." "I see..." Nanuk nodded and released his hand. "He will do," she said as she closed her eyes. I gave Nanuk a gentle kiss on the forehead before I got up. With a small gesture, I shooed Thomas outside. I would teach him the basics of maintaining the realm before I returned to the real world. There was also the question of figuring out how to give him some of my power so that he wouldn't have to tap his own spirit. Although I was saddened by Thomas' death and refusal to move on, I was glad that he would be caring for Nanuk. That would be one less worry on my mind until I could complete this bloody quest and try to return to a normal life.